Campagnolo is a highly respected manufacturer of bicycle components. Their business was started in 1933, in Italy and since then they have gone on to be a favourite manufacturer of both amateur and professional cyclists. The bicycle components are organised in group sets and have received praise from cyclists of all levels. One highly praised group set is the road wheelset featuring the Scirocco wheels. The Scirocco wheels are praised for their high level of performance by both novice cyclists and professional athletes. Campagnolo touts that just because the prices are lower, the public will still get the top level designs and performance features that the company is well known for. However, Campagnolo took it a step further with their technology and released a new G3 feature that has improved the wheels’ performance on many levels. The Scirocco wheels are a medium sized wheelset with rims of 24 mm and have been balanced for smooth spinning and high performance. This means that the wheel has a high level of stability at all speeds. This is important especially if you are a professional cyclist or participating in competitions that would require you to maintain balance when manoeuvring through a course. The Scirocco features a G3 technology in the layout of the spokes which allows for many significant benefits like spoke tension and long-lasting performance. Other benefits of the G3 technology are improved transfer of torque, reduction of stress, and improved lateral rigidity. Whilst this is a plus some cyclists have criticised this technology for only being compatible with other Campagnolo parts. The wheels are also easy to transport. Even more important for consumers is the ease of which the wheels can be assembled, replaced, or repaired and the Scirocco groupset ranks highly here. The wheels boast of an aluminium hub which provides an improved lateral stiffness and adds to the overall aesthetic appeal. The bearings are sealed and have a longer lifespan. This also leads to the maintaining of a high performance level over a longer period of time. The oversized flange improves torsional stiffness and increases reaction times during changes in speed. 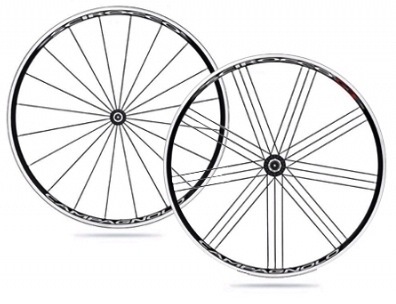 The Scirocco road wheel set are tough wheels that will allow cyclists to compete at high levels. They endure the gruelling road courses and constant changes in pace and the aesthetic appeal of the wheels have been well received by critics and cyclists. Many believe that these wheels look great and ride great. The performance of these tires has cyclists of all levels buzzing. Typically, when wheels receive this much praise, they usually cost a lot more. Conversely, when wheels are this affordable, even from a reputable manufacturer, they heavily lack in something. But, not these wheels. Campagnolo seem to hit a home run with these wheels as the price (£224.99) and the performance level are at a great ratio for the consumers.